Diagramming sentences will help you learn grammar. It will also help you write better, and it's fun! 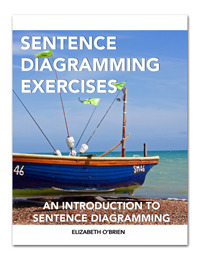 Are you ready to learn some basic diagramming with these exercises? Great! There are five questions for each section. The answers are at the bottom of the page. Don't peek until you've tried them! Subjects tell us whom or what a sentence is about. Verbs tell us what the subject is or does. Directions: Diagram the following sentences. 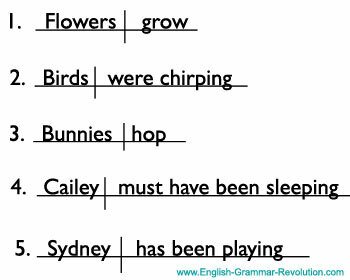 Put the subject on the left side of the vertical line and the verb on the right side of the vertical line. 4. Cailey must have been sleeping. 5. Sydney has been playing. Did you notice that all of the sentences you diagrammed above began with the subject? Well, questions (interrogative sentences) are typically written in a different order. If you have a hard time finding the subject of a question, reorder the question into a statement. Example: The question Have you been cooking? becomes the statement You have been cooking. Be sure to maintain the original capitalization of the sentence when you diagram it. Directions: Diagram the following questions. 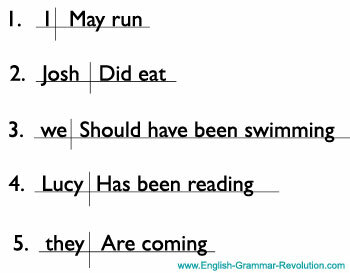 Put the subject on the left side of the vertical line and the verb on the right side of the vertical line. 3. Should we have been swimming? 4. Has Lucy been reading? Are you enjoying these exercises? Get the book! You'll learn how to diagram sentences with these short, simple lessons and exercises, and you'll find all of the answers in the back so that you can easily check your work. Move On To Chapter Two!